Anne-Marie Tipper with one of the very special Rafiki Mwema "Kings"
Over a decade ago, DDPI Board Member Anne-Marie Tipper went to Kenya for the first time to volunteer and work in an orphanage in Nakuru, Kenya. What started as one trip, evolved and blossomed into the creation of the Play Kenya charity which seeks to support traumatized and abandoned children in Nakuru. 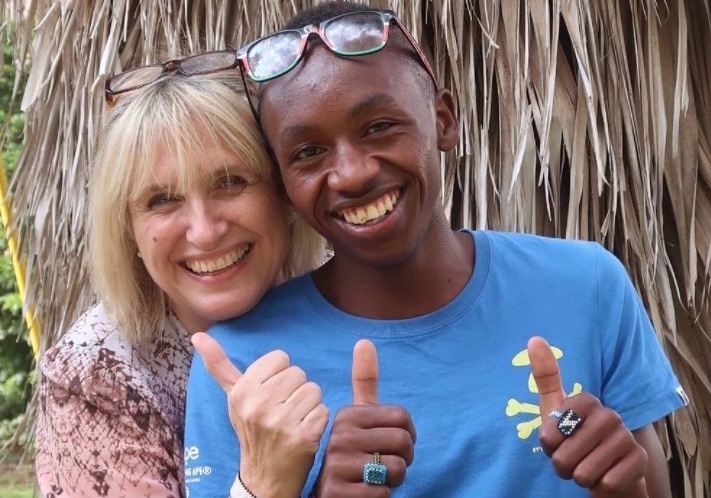 Play Kenya and its sister charity Rafkiki Mwema have created two homes for boys and a safe haven and home for girls who are sexual abuse survivors, as well as a farm to feed the staff and the children, a therapeutic play room and a school across 3 different locations in Nakuru. Anne-Marie’s remarkable dedication to the 66 children and over 40 staff members is also part of her vision to create an attachment-based, PACE-ful sense of home and community for these children to heal in. 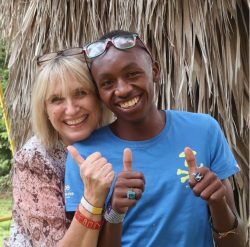 Dan responded, “Rafiki Mwema and Play Kenya are now part of me, after one week of being with Anne-Marie, John, Sarah and the others, in Kenya. My experiences there brought me closer to my ideal of how we humans need to be in the face of trauma and abandonment to our children. Rafiki Mwema and Play Kenya may be but a drop of clear, cool, nourishing water in a polluted lake, but this drop of water—I believe—may have the means of transforming the many other drops of water in the lake so that the entire lake will one day be vibrant again and bring life to all who come to drink from it. 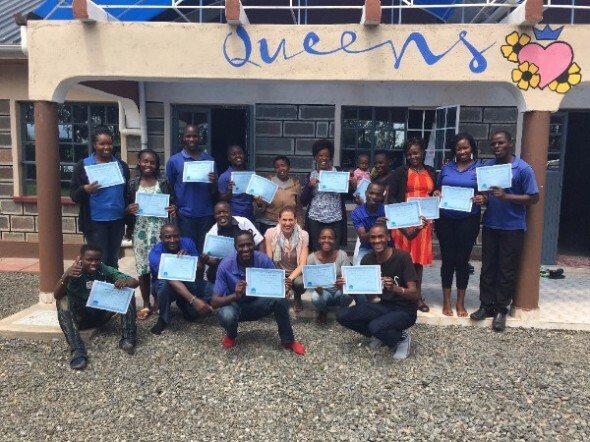 Dan Hughes, Ph.D., new Ambassador of Rafiki Mwema, went to Nakuru, Kenya to help open Queen’s Castle (home for girls who have been sexually abused) in December 2016. Following the success of Dan’s visit, Anne-Marie invited Courtney Rennicke, Ph.D. to hold the first DDP Level One training with her staff in Kenya. Courtney was “blown away by the dedication, warmth and openness of the staff to the DDP model. The Play Kenya staff truly opened their hearts to one another and quite movingly to me and created an atmosphere of emotional safety and bravery to begin to address the complexities of working with children with these profound histories of trauma and neglect, as well as spoke with candor about the cultural barriers to and drivers towards implementing this attachment-based model with the children in their care. “Say DDP!” Dr. Courtney Rennicke with the 1st graduates of DDP Level 1 Training on the entire continent of Africa! The remarkable staff at Play Kenya / Rafiki Mwema in Nakuru, Kenya.